They're a good source of fiber with 4g (16% DV) of fiber. They contain 3 added vitamins: Vitamin A, Vitamin C, and Vitamin E.
They contain "natural flavors" as an ingredient. Natural flavors are not necessarily bad but they do represent an unknown as they can be a variety of different ingredients. Ideally, it's better to be aware of all the ingredients you eat. They contain at least 4 potential allergens: almonds, cashews, peanuts, and soy lecithin. CASHEWS, DARK CHOCOLATE FLAVORED COATING (PALM KERNEL OIL, CHICORY ROOT FIBER, SUGAR, COCOA POWDER, SOY LECITHIN, NATURAL FLAVOR, SALT), ALMONDS, GLUCOSE SYRUP, SUGAR, CHERRIES, HONEY, PEANUTS, CRANBERRIES, RAISINS, RICE FLOUR, UNSWEETENED CHOCOLATE, SOY LECITHIN, CHICORY ROOT FIBER, SEA SALT, VITAMIN A (VIT. A ACETATE), VITAMIN C (ASCORBIC ACID), VITAMIN E (D-ALPHA TOCOPHERYL). Are Dark Chocolate Cherry Cashew & Antioxidant KIND Bars vegan-friendly? No. Dark Chocolate Cherry Cashew & Antioxidant KIND Bars are not vegan-friendly because they contain honey. Are Dark Chocolate Cherry Cashew & Antioxidant KIND Bars gluten-free? Yes. Dark Chocolate Cherry Cashew & Antioxidant KIND Bars are gluten-free. All 22 ingredients are gluten-free. Are Dark Chocolate Cherry Cashew & Antioxidant KIND Bars dairy-free? Yes. Dark Chocolate Cherry Cashew & Antioxidant KIND Bars are dairy-free. All 22 ingredients are dairy-free. Are Dark Chocolate Cherry Cashew & Antioxidant KIND Bars keto friendly? No. Dark Chocolate Cherry Cashew & Antioxidant KIND Bars are not keto friendly because they contain chicory root fiber, sugar, glucose syrup, cherrie, honey, cranberries, raisins, and rice flour. Are Dark Chocolate Cherry Cashew & Antioxidant KIND Bars lactose-free? Yes. Dark Chocolate Cherry Cashew & Antioxidant KIND Bars are lactose-free. All 22 ingredients are lactose-free. Are Dark Chocolate Cherry Cashew & Antioxidant KIND Bars paleo? No. Dark Chocolate Cherry Cashew & Antioxidant KIND Bars are not paleo because they contain palm kernel oil, sugar, soy lecithin, glucose syrup, peanuts, rice flour, and unsweetened chocolate. 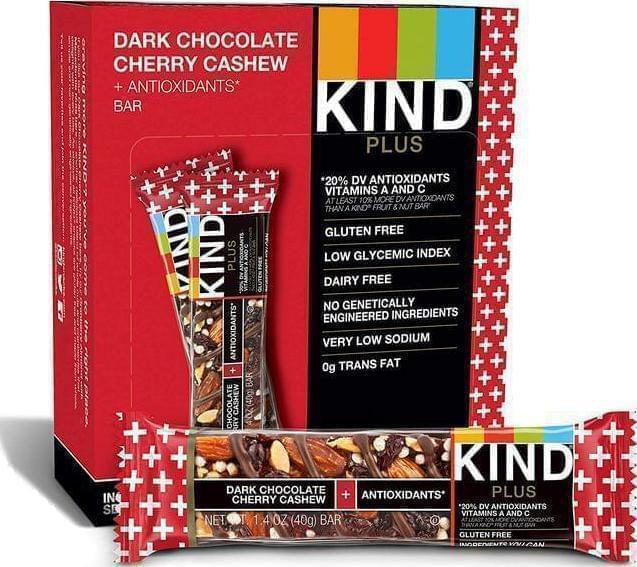 Dark Chocolate Cherry Cashew & Antioxidant KIND Bars are made by KIND Snacks.